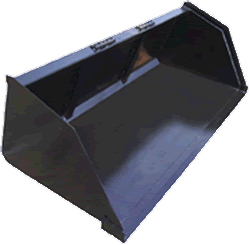 This Snow and Litter skid steer loader bucket is available from 66″ to 84″for a variety of light materials, such as grain, seed and mulch. 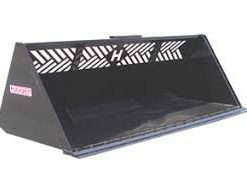 This skid steer attachment is designed to be large and lightweight so the customer can get the maximum use of the lifting capacity of the skid steer machine. It’s made of 9-gauge plate steel and its built up sides minimize spillage. Our HEAVY DUTY Snow Plow is different from most. 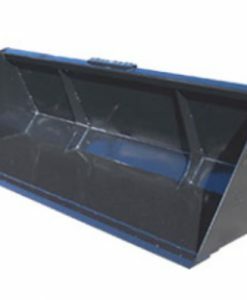 Our engineers have designed this to become an Angle Blade (Dozer Blade) with ease. 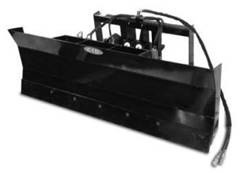 Our plows have 1/2″ thick 6″ wide replaceable bolt on cutting edges. The blade comes with two 3″ bore 6″ stroke cylinders, couplings, and hoses. You are ready to go when it is received. To use this as a snow plow, simply remove the center pins. This allows the blade to trip when hitting something. Our powerful springs retract the blade into position as soon as the object is cleared. To use as an angle blade, leave the center pins in, and you are ready to move some earth. 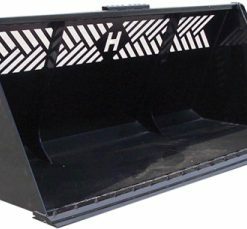 This is a 4 way dozer blade, up and down from your skid steer, and side to side from the attachment. All of our plows come complete with hoses and couplings. The plow is ready to use when you get it. – 1/2″ thick 6″ wide replaceable bolt on cutting edges. – Comes with two 3″ bore 6″ stroke cylinders. 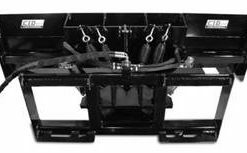 All of our plows come complete with hoses and couplings. The plow is ready to use when you get it.